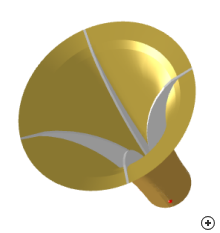 The quad-ridged horn or quadruple-ridge flared horn (QRFH) has two important characteristics: (1) a nearly constant beamwidth over a 5:1 frequency band for nominal 10 dB beamwidths ranging between 50 Ohm and 140 Ohm (2) the input impedance can be designed between 50 Ohm and 100 Ohm. The horn is also popular in weight and cost-sensitive applications where multi-polarization capable antennas are used, as only one single-ended low-noise amplifier (LNA) is required per polarisation. The performance shown below is for a 100 Ohm input resistance and a nominal 10 dB beamwidth of 75 degrees. The nominal beamwidth is taken as the average between the 10 dB beamwidths in the two orthogonal planes. The radiation performance for two different polarizations are plotted: dual-linear and right-hand circularly polarized. The radiation pattern is more symmetrical when excited for circular polarization. The graph below shows the relationship between the flare length and the flare diameter on the nominal beamwidths. For this illustration the flare diameter was set to a wavelength at the minimum frequency (0.5 x frequency center). 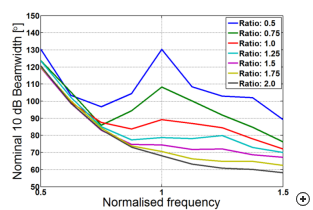 The results show that as the flare length becomes longer (ratio becomes larger), the nominal beamwidth at the center frequency drops and the change in beamwidth response is more gradual versus frequency.